Inside a gritty Brooklyn public housing facility nearly 20 years ago, New York veteran TV news reporter Sarah Wallace was firmly trying to convince a moody ruffian named Nicky Roper to step out of the shadows. And she was doing so despite the reservations of a private investigator, who feared that a spooked Roper might scurry even further underground. But as Wallace saw it, the clock was ticking. With lives on the line, it was time to get him to talk. Two innocent men – Anthony Faison and Charles Shepherd, who were serving 20 and 15 years to life, respectively, for the fatal 1987 shooting of a livery cab driver – had been languishing in upstate New York prisons. No physical evidence linked either man to the murder. Instead, they were convicted based on the testimony of a single prosecution witness, Carolyn Van Buren, an admitted crack addict who was hoping to score a piece of the NYPD’s $1,000 reward. Sarah Wallace with exclusive reporting on a citizens militia group for WNBC-TV in 2017. After the shooting, detectives approached Roper about the incident. He, in turn, steered them towards Van Buren and helped her to concoct the false account that named Faison and Shepherd, even though neither of them had witnessed the shooting. In the ghoulish brand of irony that wrongful convictions always manages to produce, it was Roper and Van Buren who held the keys to freeing Faison and Shepherd. The question would linger in the air for what felt like forever before, finally, Roper agreed to talk to Wallace. Not only was it an exclusive, but was crucial to the legal battle that resulted in two exonerations, as Faison himself told me soon after he and Shepherd were released in 2001. Wallace anchoring an edition of WABC-TV’s storied “Eyewitness News” broadcast in 1993. It’s the kind of story – steeped in long odds, dubious characters and egregious wrongs – that Wallace has long relished taking on. 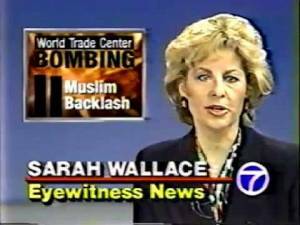 After launching her broadcasting career in California, Wallace arrived to New York in 1985 and joined WABC-TV’s Eyewitness News as a consumer affairs reporter. At a time when women were largely kept away from stories with an investigative slant in television news, Wallace battled mightily to carve out her own niche. In reviewing Wallace’s résumé, infused with plenty of exclusives, one has to revisit some of New York City’s most notorious and shameful chapters. There’s her sustained, probing coverage of the 1986 death of Michael Griffith, a 23-year-old black man who was killed on the streets of Howard Beach while fleeing a pack of bat-wielding white teens. Or the infamous 1987 beating death of 6-year-old Lisa Steinberg in Greenwich Village, which sparked a national outcry over child abuse, for which Wallace conducted a tough jailhouse interview with the girl’s killer – her father, Joel. On 9/11, Wallace was on the scene at 7 World Trade Center when the 47-story building came crashing down to the streets of Lower Manhattan. 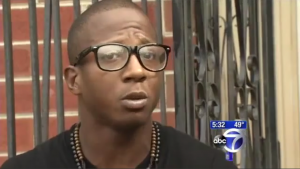 And then there’s Kalief Browder. He was 16 years old in 2010 when he was arrested in the Bronx after being accused of stealing a backpack that reportedly contained $700, a camera, an iPod Touch, and a credit card. Browder spent three years in Rikers Island, including time spent in solitary confinement while awaiting trial. But those proceedings never happened. He was released when prosecutors dropped the charges due to a lack of evidence. Well before the JAY-Z-produced 2017 documentary, TIME: The Kalief Browder Story struck a chord with viewers, word of Browder’s story first publicly surfaced when Wallace interviewed him just after he left Rikers. A mother of two and married to former news anchor Harry Martin, Wallace has more recently tackled everything from security loopholes at regional airports like JFK and Newark International to outdated equipment issued to firefighters in the village of Spring Valley in Rockland County. But it’s the gaping holes within the criminal justice system – and the individuals impacted – that remains a recurring theme in Wallace’s work. In 2003, I spoke to her in a wide-ranging interview about investigative reporting and the work required to dig into wrongful conviction cases. Tell me your reaction to Anthony Faison and Charles Shepherd being exonerated? I remember sitting in that courtroom and thinking, ‘I can’t believe this is happening. They’re gonna get out.’ Not to pat ourselves on the back, but I think it shows the power of media and its tremendous influence. I’m glad [Faison and Shepherd] got something. Was it enough to compensate them for what they went through? Of course not. You can’t compensate time and what they’ve lost. It’s never enough. You’ve handled your share of wrongful convictions. How have you determined which ones you’ll investigate and report on? I think there are a lot of cases out there that need a second look. There’s a lot of people [in the legal arena] who are trying to help with their own projects. But boy, there sure are a lot of cases out there. Then I started looking into what the evidence was since we have to reach our own independent conclusions. But it took months, which just shows you how much time it takes. You’re never handed innocence on a silver platter, unfortunately. What’s your approach when you’re tackling such a story? Well, I read through all the trial transcripts. You have to do that. You have to become, basically, a lawyer. With [Faison and Shepherd], it was a case of asking, ‘Are we missing something?’ It just couldn’t be what we were seeing, which was no evidence. And I just thought, ‘Well, I’m not seeing anything where I still don’t have questions about.’ I mean, I’ve seen cases where something will come up [to disprove a wrongful conviction]. And then I’ll just back off and say, ‘OK. That’s it.’ But in this case, there was none of that. 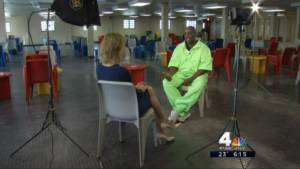 Wallace and infamous subway thief Darius McCollum at Rikers Island in his first TV interview (2016). Talk about reinvestigating cases which don’t involve DNA evidence. It’s tough to go back and find the witnesses. And oftentimes, it’s not as clear-cut. And it takes a tremendous amount of legwork. A lot of them are single eyewitness cases. And that’s a problem. So many people are convicted based on a single eyewitness. And the other thing is, it does become – at least for me, personal. I need to feel comfortable about going out there and doing it. I need to get a sense of, ‘Are they telling the truth? Are they not? Do they have a reason to lie?’ You can’t depend on somebody else for that. A lot of it is street stuff. And you have to know how to work the street. Traditionalists say that a reporter should keep an emotional distance. What do you think? Well, I think you can certainly present both sides. You can present what the DA says. You present what the evidence says. You’re not necessarily making a judgement call. Kalief Browder speaking to Wallace in an exclusive interview just after being released from Rikers. Trying to uncover a wrongful conviction is, as you’ve rightly pointed out, extremely difficult. How do you grapple emotionally with that given the many roadblocks? Sometimes it breaks your heart because you just can’t do them all. I just don’t have the time to do all the ones in which there may be something there. A couple of them I have. But that’s the problem of getting personally involved. You do get emotionally involved. You can’t help it. Of course I’ve sat there afterwards and vowed, ‘I was never gonna get involved again. I’m not gonna do this anymore. I’m just gonna stick with stories where you just do a great job and don’t have a stake in the families and the person.’ And it’s sometimes too painful. And then you just find yourself out on another story. Even in this turbulent climate for the media business, we’re still seeing some stations launch investigative units. What do you think is happening here? I think they’re realizing that it’s important. You cannot dig on day-of air stories, for the most part, with the pressures of a 5 or 6 o’clock deadline. And so, this enables us to do stories, which in my mind, have a real social significance. I’ve talked to news directors in small-market and medium-sized stations alike across the country. They told me about the letters they’ve received from the incarcerated and how a lack of resources prevent them from trying to expose credible wrongful convictions. Are television stations doing enough from your vantage point? Unless the station is a big operation, or has a big investigative unit, there’s little they can do unfortunately. But I do think that there’s much more being done in this area than ever before [in media]. And, in my mind, it’s because I think more people are realizing that there are so many more cases out there. Could [outlets] devote somebody full-time into looking at law cases or potential wrongful conviction cases? Sure. But I understand that not everyone can do that given the staffing and the budgets. So the question is not, ‘Are we doing enough or are they doing enough?’ It’s whether we’re actually trying. Below, here is footage of Sarah Wallace with an exclusive interview with Julio Acevedo, who was a wanted man after a deadly hit-and-run in Williamsburg in which he crashed his vehicle into a livery cab in 2013. Killed in the incident were Nathan and Raizy Glauber, both 21, and their unborn child. In 2015, Acevedo received a 25 year to life sentence. 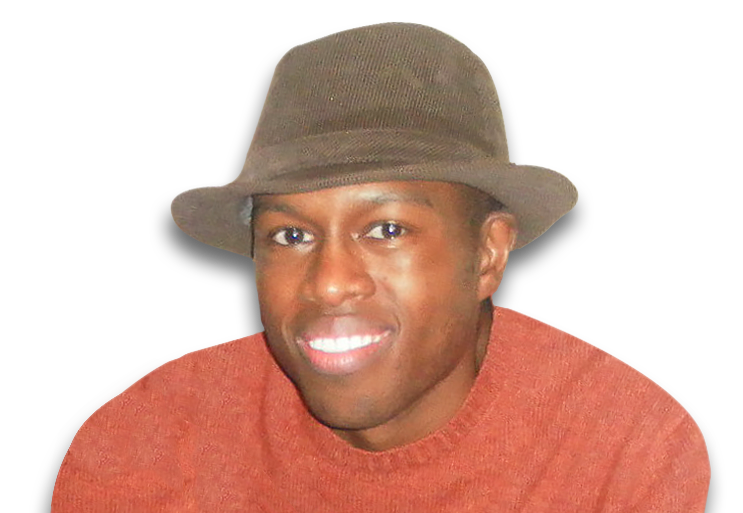 Curtis Stephen is an award-winning New York-based journalist whose work has appeared in Newsday, Newsweek and The Daily Beast. What those two men went through was very sad. So much time in jail for a murder that they did not do. It was beautifully written, Curtis. Thank you.